A: Hosting a clinic can be a great opportunity to learn from someone new and to hopefully make a bit of income for yourself as well! However, it’s important to be well-organized and prepared. The Clinician – While it sounds like in your case you already have a specific clinician planned, if you do not, it can be important to do your homework on what clinician you’d like to bring in. Is what he or she teaches in line with your own program? Is he or she the right fit for the level of riders that you are trying to attract? Will it benefit participants? Is there enough interest in the area for a clinic with this person? Liability – Once you have the clinician and date picked out, it’s important to make sure that your bases are covered legally. If your clinician is training or giving clinics regularly, they should already have their own liability insurance; however, it’s important to confirm this with the clinician well before the clinic date. 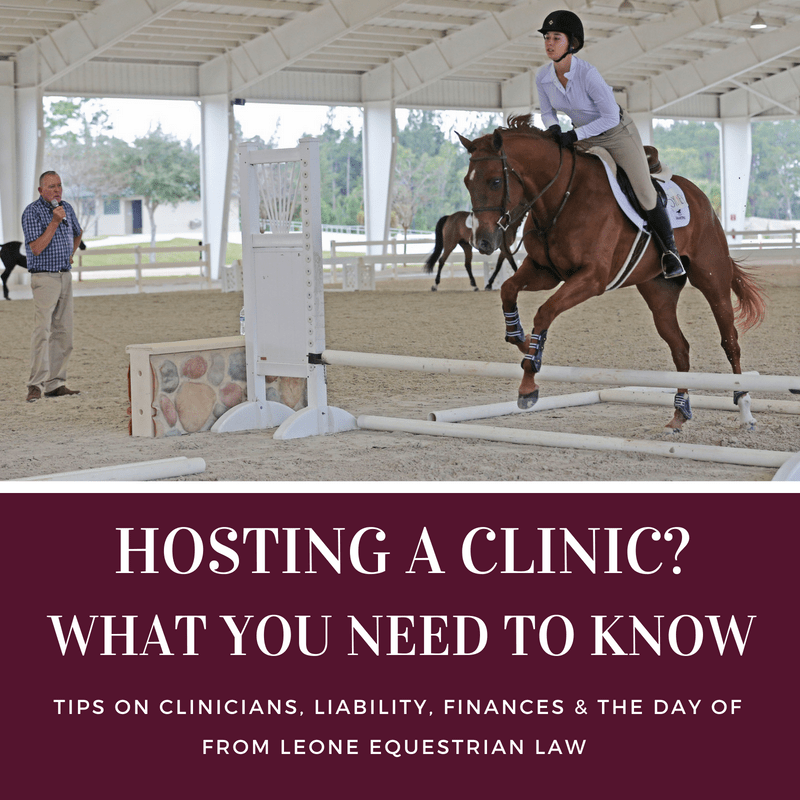 Since you are hosting the clinic at your own property, if you have boarders there now, you should hopefully already have the proper commercial liability insurance in place, but if for some reason you do not, it’s also vital that you have your own liability coverage. You should also contact your insurance provider before the clinic to make certain that your policy covers this activity. Additionally, you will want to have all participants sign a liability waiver for you and your business; the clinician may also require riders to sign liability waivers for her benefit. Almost all states within the U.S. now also have Equine Activity Liability Acts. Make sure the mandated liability warning signs are displayed on your property. In addition to 911, make certain that the contact information for the local EMS ambulance corps and hospital is readily available for you and staff in case of any emergency. When setting the clinic participant fees, it’s a good idea to set your fees so that the clinic will cover your expenses even if it is not 100 percent full, and it’s often recommended that you require full payment in advance with no cancellation policy. That way, it is up to the rider to be there, and you are not short on funds if riders cancel or back out last minute. If your clinic does fill quickly, maintain a waiting list so that you can fill spots in case of such cancellations. The Day Of – The day of the clinic, your job is to be a courteous host – and to enjoy and learn from the clinician yourself! As participants are arriving, make sure that there is clear signage or someone to direct them where to go and where to park horse trailers. Start the clinic on time and adhere to the set schedule (which it’s wise to have posted at your barn). Have water and beverages available to the riders, auditors, and clinician – particularly on hot days! Take the time to talk to participants over lunch or as they’re leaving. Thank them for coming, and ask them for their honest feedback. And then relax and appreciate that you just successfully hosted a clinic!